One of the best things about a big Thanksgiving turkey dinner is that it keeps on giving! If you’re long on turkey leftovers but short on ideas for what to do with them, we’ve got you covered. Here are some of the best tips and tricks shared by our readers. 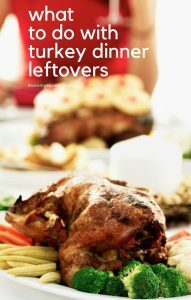 Join the conversation here: What is your favorite thing to make with turkey leftovers? While the turkey is still warm, pick all the meat off the bones (save the bones for making turkey stock). Divide into quart-sized Ziplock freezer bags. Make sure you get all the air out of the bags, as any excess air can cause freezer burn. If you have a little bit of the turkey drippings, it’s ok to add that as well, as it keeps your turkey moist when you thaw and re-heat it. With a Sharpie, date and label the bags. When it comes time to thaw your turkey, let it defrost in the fridge overnight. One dish that my family makes every year using Turkey leftovers is “burrito mix” (what my kids call it). You saute leftover turkey with onions, potatoes, zucchini (if your kids like it) or yellow squash, a can of diced stewed tomatoes w/juice, garlic, salt & pepper to taste. Let it all simmer until the potatoes are done. I either serve it over white rice or make burritos with it. Get some big tortillas, a can of refried beans, cheese, etc. Talk about grub!! Saute 1/4 C. green pepper 1/4 C. chopped celery and 1/4 C. chopped onions in margarine until soft. Add 2 C. chopped turkey and 3 C. gravy. Bring to a boil. Reduce heat to low and cook for about 15 to 20 minutes. Serve over rice or mashed potatoes. Heat oven to 400 degrees. Grease pie plate (10 x 1 1/2-inches). Sprinkle turkey, mushrooms, onions, salt and cheese in pie plate. Beat remaining ingredients until, 15 seconds in blender on high or 1 minute with hand beater. Pour into plate. Bake until knife inserted between center and edge comes out clean, approximately 30 to 35 minutes. Cool 5 minutes. Serves 6 to 8. 30 minutes. Should brown slightly around the edges. Mix all together and pour in greased casserole. Bake uncovered at 325 degrees for an hour. Cook noodles in boiling salted water for 10 minutes and drain. Chop garlic and parsley together. Place oil in skillet, heat and add mushrooms, garlic, parsley and salt. Cook slowly for 4 minutes. Stir. Place butter in another saucepan. Melt. Add flour and blend. Add hot chicken broth, stirring constantly until it thickens. Remove from heat. Add cream and wine. Stir well. Place drained noodles in a buttered oven casserole or 13 x 9-inch pan. Spoon mushroom mixture over the noodles and arrange turkey over that. Pour the cream sauce over all and sprinkle with the cheese. Bake at 350 degrees for 15 to 20 minutes. Grease bottom of 9 x 13-inch pan. Mix soup and milk; fold in sour cream. Put pieces of turkey or chicken on bottom of pan. Pour the sour mixture over meat. Mix dressing to recipe on package. Put on top of meat. Cover pan with foil. Bake at 350 degrees for 1 hour.